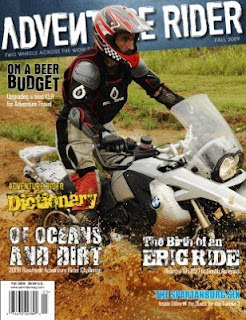 The maiden issue of what may be the first magazine dedicated to motorcycle adventure-touring, Adventure Rider, is only 36 pages, but they're chock full of great content and photographs. Publisher James Pratt is hoping to offer subscriptions soon and to publish 6 issues in 2010. You can preview and/or order the Fall 2009 issue here. Thanks for highlighting the magazine. We are working on the next issue right now.